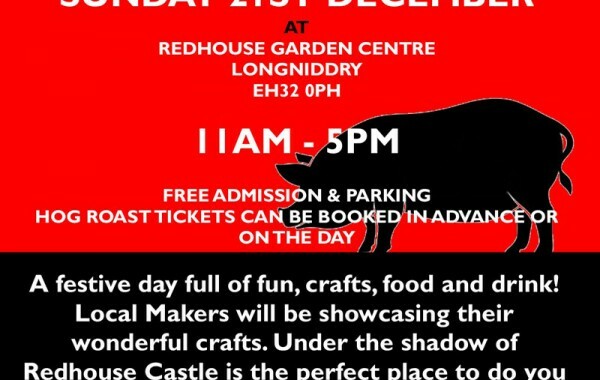 After the success of last years Christmas Craft Fair, we will again be holding the festive event on Sunday 21st December. 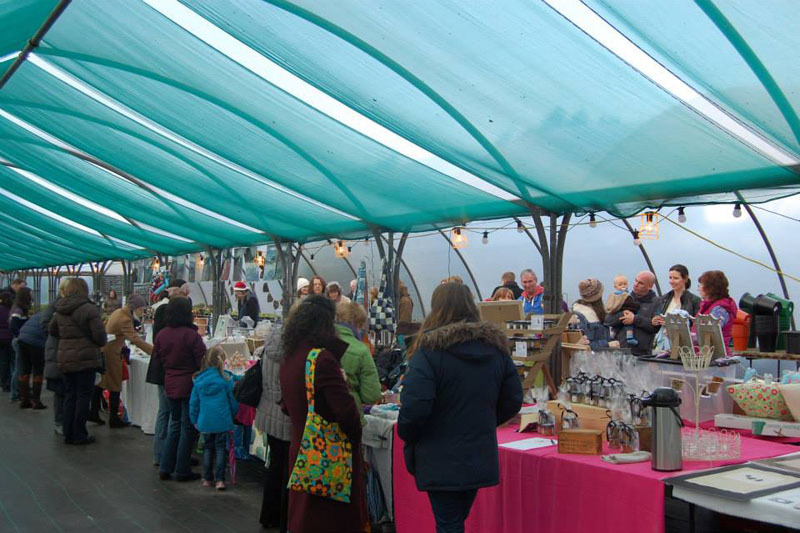 Feedback from the day was fantastic and we have made room for even more great local makers than before!Join us on Sunday 21st December for festive fun, food and frivolity. 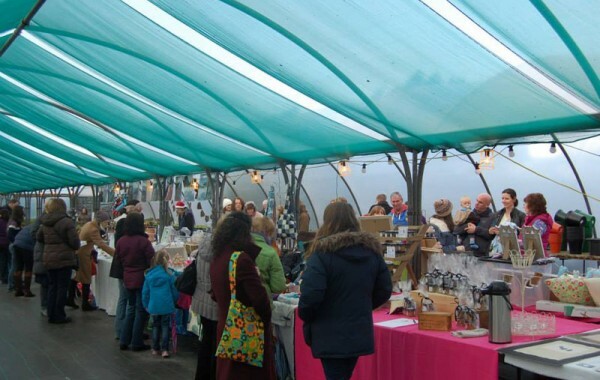 The Garden Centre and Tea Room will be open from 10am – 4:30pm as usual, the Craft Fair begins at 11am and finishes at 3pm. 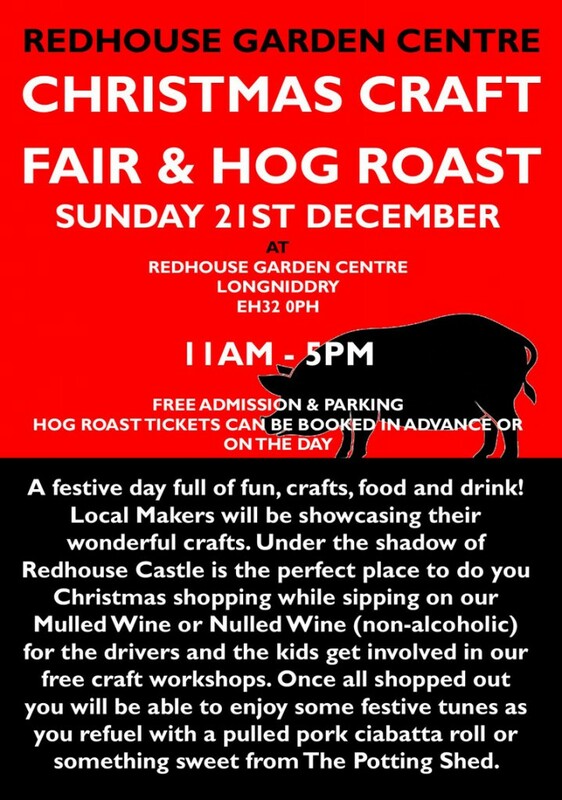 Hog Roast begins at 12pm! Tickets for the Hog Roast are £6.50 and are available to buy in advance or on the day (subject to availablility), this inclues a pulled pork ciabatta roll with rocket leaves and a choice of three relishes. Keep checking back for updates as we will adding more details closer to the day! Here is a full list of all our lovely makers on Sunday! Hand made Jewellery and Mixed Media Pictures, inspired by the sea. Lampwork beads and jewellery. Fused glass jewellery, coasters and art. Handmade wirework and semi-precious jewellery. Hand painted and dyed silks. “‘All Mixed Up’ specialises in baking mixes made from fine ingredients…With easy to use instructions… you will make delicious baked products in no time. Spice Pots are Indian Spice Blends, each with a recipe card, to make delicious curries simple. They are pretty enough to make fabulous gifts for foodies or a great wee stocking filler. Superlative Pearls jewellery is absolutely gorgeous and is made from freshwater pearls, Czech crystal and gemstones. With handmade pieces no two items are ever exactly the same. LTL supply essentials for your bed linen cupboard made with 100% cotton and high thread count. LT candle range is handmade and hand poured in the UK. All made with 100% soy wax and essential oils they are aromatherapy candles made to relax and enjoy scents of 20 hours and more. Welcome to my gallery of favourite images taken on my travels around the British Isles. Delicious artisan chutneys, relishes and mustards. Perfect as gifts for friends and family, or as a wee treat to yourself! Hand printed (using painted rollers) cards, bags, boxes and tags and an array of nature and woodland themed items. Charms, jewelled scarves, mix ‘n’ match jewellery, decorated gifts, accessories and homeware. East Lothian based upcycling network, specialist in converting old or discarded materials into something useful and beautiful! Ink & Wash offer a range of drawings in ink, some framed and some unframed. Many have a wintery or fairytale forest feel. Shon uses acrylics and watercolours in her paintings, mostly inspired by places she visits.